Writing an essay often seems to be a difficult task among students. So your teacher assigned you to write an essay, and you find the task dazing. 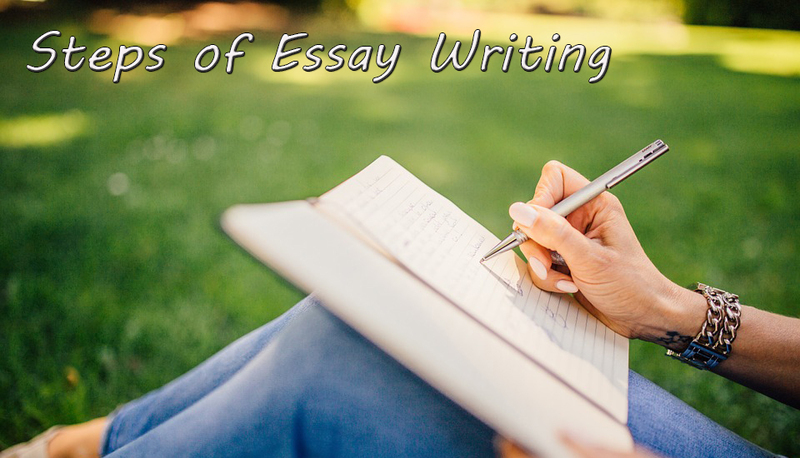 Just put pen to paper and follow the following steps of essay writing and write a successful essay. There are four steps of essay writing. Before starting writing, you need to collect different ideas about the given topic so that you may be able to write easily. And there are three useful ways of generating ideas. A. Brainstorming: To do brainstorming, you make a list of everything whatever comes to your mind, which you think can be used in your essay, like phrases, ideas, points. After brainstorming, you mark usable points, arrange them and start your essay writing. For instance: The following example shows how you can brainstorm about the given topic, such as “Quetta City”. 5.Majority of the population is literate or illiterate? 7.What are the causes of pollution? 9.Sanitation is half of our faith. 11.Are people of Quetta aware of rules? 13.Are the roads broad or narrow? 14.Health facilities/ private and government. B. Branching: In branching, we take out main related points from the topic and then main related points; we take out the sub related points. Branching, we have learned from a natural process of a trunk. For instance, branches come out from a trunk and then branches from other branches. Think that your given topic is the trunk of a tree and you know that branches come out from a trunk and other branches branch from the branches which come out from the trunk. So, write the main points of your topic as those branches which come out from a trunk and then write the sub-points from your main points as those other branches which come out from all other small branches. In free writing, you take a pen and write whatever comes to your mind about the topic. Note: Branching is the best way of generating ideas. When you collect ideas, the next step is to think how to organize them. You organize the points in such a way that they must match and agree with one another. The theme must go like a thread through the beads of a necklace. When you revise, examine what you have written and try to make it better, clearer, more complete and more interesting. In revising, you may change, add, delete, or re-arrange your ideas and words. Proofreading is checking of grammar, spelling, punctuation and capitalization errors. Reread your paper and check to see if it makes sense. Make sure that sentence flow is smooth and add phrases to help connect thoughts or ideas. No, you have written a great essay. feel free to ask a question and share your views in the comment box below. Moreover, If you are too busy with your studies or work and need quality assistance from academic writers, contact essaylib.com. A professional essay writing service for students reliable and 24/7 accessible online. Note: This is a guest post, written by an English instructor (Shakila Hussaini).